Kim later explained in a separate post titled The Truth About My Pregnancy Decision, why she was unable to carry her own child, also opening up about how difficult it was not to. She wrote on her website, "I have always been really honest about my struggles with pregnancy. Preeclampsia and placenta accreta are high-risk conditions, so when I wanted to have a third baby, doctors said that it wasn’t safe for my — or the baby’s —health to carry on my own." Also read: Chrissy Teigen: "I'll be a surrogate for Kim Kardashian!" She continued, “People assume it’s better because you don’t have to deal with the physical changes, pain or complications with delivery, but for me it was so hard to not carry my own child, especially after I carried North and Saint." 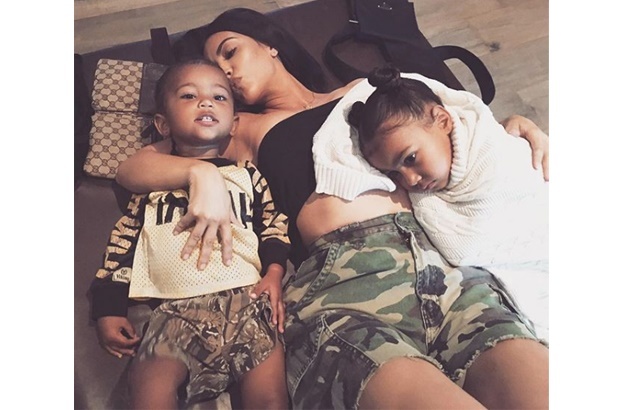 Kim with Saint and North West. She also explained that although the term surrogate has been used throughout her pregnancy, she in fact had a gestational carrier which she found through an agency. "A traditional surrogate donates her egg, is artificially inseminated with the father's sperm and then carries the baby to term. Since we implanted my fertilised egg in our gestational carrier, our baby is biologically mine and Kanye’s." She is however, expectedly over the moon and so very grateful, saying "Our gestational carrier gave us the greatest gift one could give. The connection with our baby came instantly and it's as if she was with us the whole time. “Having a gestational carrier was so special for us and she made our dreams of expanding our family come true. We are so excited to finally welcome home our baby girl." Also read: Bible! Khloe Kardashian is pregnant! *Disclaimer: The views of columnists published on Parent24 are their own and therefore do not necessarily represent the views of Parent24. When conceiving becomes more of a mission than a pleasure, there are many options like adoption or IVF (in vitro fertilisation); while others choose the option of surrogacy. But do you really know what you're getting yourself into by choosing a surrogate mother? Or how about what it’s like for that “other” woman, carrying your baby? I kept wondering how a woman, who is carrying another couple’s baby, feels. How does she tell the lady in the supermarket who admires her baby bump that she’s just the carrier not the caregiver? Personally, even though I may not be a mom yet, I couldn’t imagine carrying a bundle of joy for nine months, only having to give it up the minute he/she is born. Speaking to Jenny Currie, founder of baby2mom Egg Donation Agency, I realize that it’s really not as easy as one imagines, despite what people may say. But the rewards are. Choosing to be a surrogate mother or choosing a surrogate mother isn’t as simple as buying something online. There are lots of things to consider. The cost for instance of the process of surrogacy should be covered by the parents to be. And contribution costs every month can range from around R1000 per month for a hospital plan to R3500 for an executive plan. The surrogate mother may never keep the child. The updated Children's Act that became effective from 1 April 2010 requires commissioning parents to obtain a high court approval of the surrogacy contract which gives the parental rights and responsibilities to them, ensuring that the surrogate mothers cannot keep the baby. So saying that surrogacy is a mere contract between the carrier and the parents is rather aloof. Instead it could be seen as a gift bestowed onto a couple from someone who is willing to offer a childless couple the ultimate gift of love. Surrogate mothers choose to help couples for various reasons but the most common reason is that they’ve seen a family or friend go through the hardship of trying to conceive. So it may be costly, but the result is well worth it. Could you ever be a surrogate? Do you have any stories of surrogacy you’d like to share? Tell us by commenting below or emailing chatback@parent24.com and we may publish your comments. Is surrogacy safe in SA?